Q.Approximately 18 months ago my roof was re-tiled. Today, my neighbour knocked on my door to state that he has a leaking roof and this is because he has some broken tiles, and is blaming my builder for doing this. My builder stated he didn't go on the neighbours' roof at all. The neighbour is saying that we must pay for the damage. I feel we have done nothing wrong. What should be our course of action? Given that your builder denies even going onto your neighbour’s roof in the first place, the onus here is on your neighbour. He must be able to able to prove that your builder was the cause of his current roofing problems. Broken tiles are often caused by bad weather - in particular, strong winds, hail or even heavy rain - or it might simply be a case that your neighbour’s tiles are quite old and that they’ve cracked under the strain caused by inclement weather over the years. On the other hand, your builder’s denials may just be a cover up. You are unfortunately stuck in the middle when deciding who to believe. However, the only way to have the matter resolved would be for you to suggest to your neighbour that they hire a buildings or roof surveyor to come out and inspect the damage. A professional eye would be able to tell whether or not the broken tiles could possibly have come about as the result of your builder’s activities, if it was more likely to be down to weather damage, or the fact that the tiles were old and needing replacing anyway. Your neighbour would be able to claim on his household insurance for the costs of this survey to be carried out. Should the surveyor’s findings prove that your builder was negligent then you have a couple of options. You can then either agree to pay for the damage to your neighbour's roof, or you can hire your own surveyor for a second opinion. In cases where two surveyors may have different opinions, then you could either agree to split the costs of repairing the damage with your neighbour, or make a decision to jointly agree to appoint a third and final surveyor and to stand by their findings. However, it should be re-emphasised that from the information you’ve supplied here, there is no evidence that you or your builder have been guilty of any wrong doing, so it really is up to your neighbour to prove otherwise. Your neighbour could decide to take you to court, which should always be a last resort as it can be a very costly affair for both parties. Basically, it all very much depends on how you feel towards your neighbour. If the damage is relatively minimal, you might think it’s easier to suggest splitting the costs of the repairs, as a small financial outlay might mean less hassle all round and will help you to maintain good relations with your neighbour. However, until your neighbour proves any differently, you are under no obligation to pay for anything. Hi, my neighbour is going through demolition and extension works. They reported that the shared wall is about to collapse and its my responsibility to fix. We share a wall which is my garden's back wall but their right side wall, this wall is a contention wall as my neighbours house is around 2 meters below ours. I have checked the Deed but there is no information on who owns my back wall, but are we responsible for the damage when they are doing demolition and moving and excavating the grounds? Thanks for any help on this! My neighbour has damaged the gutter of my property, because of this damage rain water directly pouring to the wall and damaged the wall,also water coming to one of my bed room through the window. Where can find assistance regarding this issue please? Talk to your neighbour? Are they aware they have caused the damage? Will their insurance pay? If you can't resolve this between you, you may have claim damages via the courts. Hello!I am reaching out for some advise on a neighbor situation I have been experiencing.I live in a coop I purchased 11 years ago.I had great neighbors for the last 8 years and they have sold their coop.Now I inherited an individual who has some type of mental issues.He slams things around the apartment and I feel and hear everything in my apartment.I don't know when to expect it so I walk around on egg shells and edgy all the time.It is affecting my quality of life and most of the time I don't want to go home.This person does not work so I can't even take a day off because I prefer to go to work than to be home knowing he is there.I have spoken to the Property Manager and to the Board and I have been informed that it is hard to proof noise problems when your neighbor is right next door.I have spoken to his aunt and uncle who actually purchased the apartment and they placed rugs in the entire apartment but it is more complicated than just installing rugs.They are not revealing any information on his actual condition so I am afraid to confront him.I am at my wits end and I don't really want to sell my place as I have a good ten years before retirement.What are my resources? What are my actual rights? Any advise is much appreciated. A party wall notice should usually be given ifthe work might have any possible structural consequences (e.g strength & support) for the party wall. If you're happy with the brackets being there and the neighbours agree to repair any additional damage, then you can usually resolve this between you. I have a new build property which was built by a contractor, in building they have dug out some virgin ground on my neighbours side who i purchased my land from, the adjoining land owner neighbour says i am liable for my builders actions even though i told the builder not to do anything without the land owners permission in writing,the builder has acknowledged to the land owner his error and has agreed to put the material back correctly. Am i liable for this or is the builder - Please advise? The adjoining neigbour is also saying the house has been built in the wrong place by the builder and he says i am liable for this aswell, he is trying to bully me into buying the plot that the builder has encroached onto, even though he agreed to a boundary line in writing and the house is within this. He is trying to get me to build a wall to hold the foundations for the next plot and says i have to do this even though i dont have anything in legal writing to say i need to do this - can you please help and advise? Please help. I live in a terrace house on the end, my next two neighbourrs have had work done on their gutters. Prior to this I had the gutter repaird as there was a leak. The leak was rectified and was not leaking before the work was done. Since the work has been done, the window is leaking. I have had this checked by the people who did the original repair and they have advised me that the gutter has droppedpossibly due to the vibrations from work being done on the neighbouring houses. I have contacted the company who did the work and they have not replied to my question- asking them to come and look and rectify the problem. I have gone back and told them this - but still no reply. I now want to take this a step further as I have been in contact for 3 weeks and still not had a suitable answer. How do I take it further? I've just noticed a hole in my garage roof.. My nieghbour has had a tree cut down between our garages, two weeks ago.. I've just asked him if he knew about the hole. He said he knew about a bit on the side, and has some glue to restore it!! I've told him the hole is in the middle.. He is out side at the moment trying to repair it.. But I know it won't work.. I said the tree surgeon would be insured, but he said the guy was doing him a favour!!! Is my nieghbour liable for the cost of repair?? The tenant of one of the flats next door to me blames my roofer for damage to his new car. It has a scratch on bonnet and tenant says my roofer has thrown something down and it has scratched his car. My roofer flatly denies this allegation. The tenant texted his landlord who then came round to ask what we were going to about it as he believes that roofer did do damage. We said that he must talk to the roofer. The tenant spoke to roofer who still says it has nothing to do with him. The landlords wife then came round and said that she is going to tell her tenant to claim on roofers indemnity insurance or failing that will claim on my buildings insurance. I am retired and don't want any trouble but will I be taken to court? I am really worried. I had my roof retiled two and a half years ago by a local registered roofer , my neighbour has just sent me a letter claiming that there is a hole near the adjoining chimney that is allowing water to penetrate his internal walls , he claimed he had experts to verify this even though I was not given any of his experts written findings , his roof tiles are old and uneven in places . 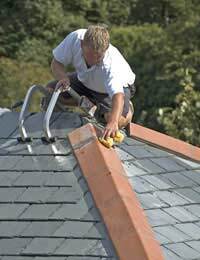 I have told him to contact the roofer who carried out the work on my roof who is liable? Our neighbour employed a contractor to replace his tiled roof.We have a one storey extension with a flat, felted roof.The neighbours contractor came onto our flat roof and broke some of our tiles on a lower roof and then concreted a hip, completely on our side of the boundary, directly onto the felted roof.When we realised what he had done, we asked the contractor to remove the hip from our roof and replace the tiles he had broken.The contractor refused to do either.He said it would cost him money to do what we requested.We have been in touch with the Guild of Master Craftsmen but who is responsible for the damage?Is it our neighbour or the contractor? We asked an independent roofer for a survery and he said that what the neighbours contractor had done was wrong and would cause us problems in the future when we tried to maintain our flat roof or even when we replaced the tiles that the neighbours contractors had broken. A couple of months ago we had a new glass room fitted to our sun room, the glass has a self cleaning coating. Our neighbour's employed a company that put a weather proof coating on their roof, the process involved pressure washing their roof which coated our glass roof with debris including grit and cement particles. This debris is ingrained on the glass and even with the heavy rain recently has not come off. Our roof came with a 10 year warranty which the company who installed it would not guarantee if the coating is damaged by trying to clean the grit off it. We have been in dialogue with the company who were employed to put the coating on (they sub-contracted the work to another company)the roof and currently they are not prepared to replace the roof. They have had a number of cleaning companies visit and meet with the glass installation company rep and they all refuse to give a guarantee ifthe cleaning does not work. We are now at an impasse and are getting very frustrated, legally do we continue to deal with company who our neighbour employed, the sub-contractor or our neighbour direct - who is liable for the damage?